Home > Newsroom > News Releases > Make Fridays Your Movie Night This Summer! Make Fridays Your Movie Night This Summer! CORPUS CHRISTI, TX – Come be part of a 15 year summer tradition! Take your seat under the stars and watch a different film each Friday during the Summer 2018 Bay Jammin’ Cinema Series. 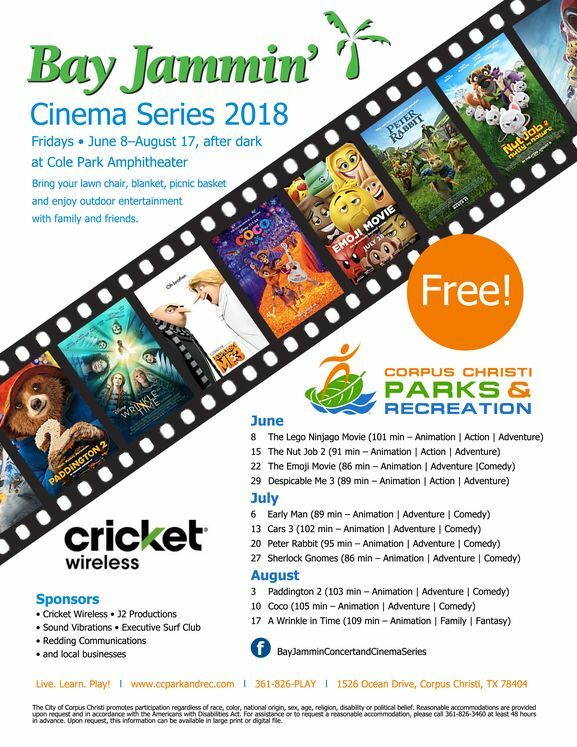 Each movie will be set up at Cole Park Amphitheater against the beautiful backdrop of our Corpus Christi Bay waterfront. Bring the whole family and have an evening of fun under the stars. All featured films are family-friendly, closed captioned and will range in genre from action to adventure to comedy. This program is supported by the Corpus Christi Parks & Recreation Department’s Cultural Services, Cricket, J² Productions and other local businesses. For the complete movie line-up, visit www.ccparkandrec.com (Bay Jammin’ Concert & Cinema Series). For more information, call (361) 826-PLAY or “like” us on Facebook at https://www.facebook.com/BayJamminConcertandCinemaSeries .